One early December a few years ago, my son asked if I would fill a cookie basket for his new landlord’s two little boys. I was making multiple dozens of cookies at the time, so I stuffed a green wooden Christmas basket for them and sent it off. The following July when my son was visiting his landlord, the youngest boy approached carrying the basket as if to say “Please, Sir, may we have more?” Since then, the basket finds its way back to me in summer, and I overfill it for them every Christmas. It’s a new tradition of sorts, however short-lived it might be. 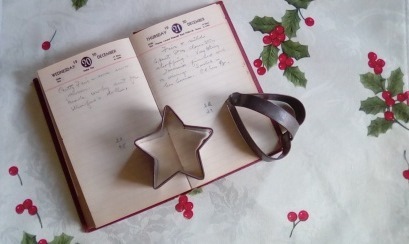 This year, while working through a binder of cookie recipes for my annual attempt at baking All Things Cookie, I’ve thought how my maternal grandmother’s 1950 diary might illuminate her Christmas preparations, cookies in particular. As is so often the case in research of any kind, what we find is not always what we wanted or even what we expected. The only real tradition noted came on Christmas Eve when my grandmother’s family “had tree,” i.e., opened their presents. Her family always opened their Christmas presents on Christmas Eve, probably because mornings were too busy with farm chores. (Cows have to be milked when they have to be milked, period.) Succinct even in the face of celebration she continued: “Went up to Aunt Dora’s in AM to take her Xmas presents. Gave her one frozen strawberry.” I’ll never know if that was a tradition, a joke, or just snarky. Notable in all the entries for November and December 1950 is that there is Not. One. Cookie. Mentioned. No gingerbread men, no cut-out sugar cookies, and definitely no sugarplums. There is a regrettable lack of cookie recipes in the few recipes of hers that I have, including the one for the molasses cookies that my brother and I still crave. I question whose granddaughter I am that my grandmothers and great-grandmothers made holiday food preparation so routine that tradition had no grasp. And then, out of my “squirrel bins” appeared two well-used, tin cookie cutters in the shapes of a star and a heart. Some grandmother apparently didn’t stop at drop cookies. For years I have made several dozen cookies of all kinds to give away at Christmas. It is, thankfully, neither my tradition nor my routine, but three solid weeks of work I enjoy to quell that insistent inner demand for sugar and butter. Isn’t that what a holiday food tradition should be, a fun variation of a work routine? Thank u, do enjoy ur stories. They’ve made me laugh, cry, and remember growing up and wanting to know more about who I am & why I do some things . Have a wonderful Holiday Season. Really appreciate you and people who work so many hours to help us find r past families lives. I’m thinking by “one frozen strawberry,” she meant one of the packages of frozen strawberries that she brought back. Maybe she planned to use both packages, but didn’t, so returned one. Nice memories. I have an old, yellowed 3×5″ card with a recipe for peanut butter cookies that belonged to my late mother. When she gave up baking and gave me the recipe card, I asked her where she got it and she did not remember. My siblings and I all grew up eating these wonderful cookies. My kids grew up eating them and my grandkids love them. My daughter has a copy of the recipe, and made them for her family and now for her grandkids. That makes 5 generations who have enjoyed the recipe. Who knows how many more will continue the tradition? I have some of my gr-grandmother’s (1870-1967) diaries ranging from 1932-1964. 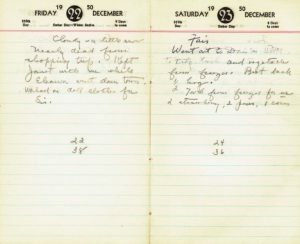 They read similarly to what you mention — weather, chores, who died/was sick/was born, and maybe what she ate for dessert. 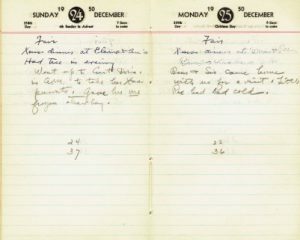 No more than four sentences except for the Jan 1 entry which always included the Rose Bowl football game score. I wonder if that style of journal-keeping was generational or just “how it was done”. 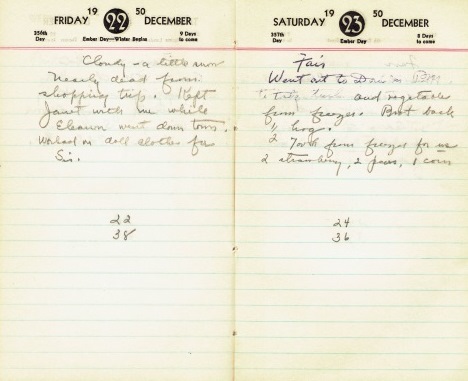 My grandmother’s 1910 diary also tells about the weather, her prodigious baking (several pies, bread, cookies all in one afternoon), cleaning…she had roomers in her big house, and often speaks of “moping”. I know she meant mopping, but I might mope if I had to clean up after roomers along with family. She also wrote about many visits to church each week, and thimble parties with her friends. Not sure what that involved, but it’s all a treasure.